Above figure from Cano (2014; ApJ, 794, 121). The luminosity (k) and stretch (s) factors of eight GRB-SNe (not including the template SN 1998bw). Top Panel: Combined data in rest-frame filters U (purple), B (blue), V (green), R (red) and I (brown) are shown. 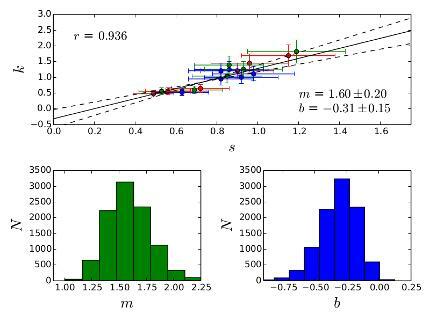 The data were analysed with a linear-least squares method coupled with a Monte Carlo simulation to determine the slope and y-intercept, and their respective errors, of the fitted line. The best-fitting parameters are m=1.60+-0.20 and b=-0.31+-0.15, where the quoted errors are 1-sigma, and are the standard deviations of each variable (see below). Also plotted are the 2-sigma uncertainty limits of the fit (dashed lines). The Pearson's correlation coefficient of the combined data is r=0.936, and the two-point probability of a chance correlation is p=4.2x10^-9, which indicates the potential use of GRB-SNe as standardizable candles. Bottom Panels: the distribution of the fitted values of m (green) and b (blue).